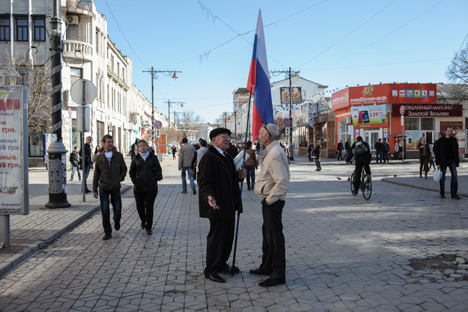 Over half of Russians (52 percent) are confident that the Crimean independence referendum was an exclusive initiative of the Crimean administration, Levada Center told Interfax. A third (34 percent) suspect that "Russian authorities might have been behind the referendum." Fourteen percent of 1,600 respondents polled in 130 populated localities on November 21-24 are undecided. However, 65 percent of respondents think that the Russian decision to incorporate Crimea immediately after the referendum was correct. "It had to be done very quickly," they said. Sixteen percent argued "there should have been no haste, the issue should have been discussed with the Ukrainian authorities and its consequences should have been evaluated." About a tenth of respondents (11 percent) said it was wrong to incorporate Crimea immediately after the referendum because "it was clear from the start that the risks posed by that decision were too great." Two percent said "the move should not have been made at all." Forty-six percent of respondents asked to define Novorossiya (so-called "Donetsk and Lugansk people's republics") said it was a historical region in southern Russia. Another 25 percent said it was a historical term which had no meaning nowadays and 8 percent said that Novorossiya was a myth invented by modern Moscow. Twenty-one percent failed to answer the question. The poll demonstrated that most Russians (64 percent) did not doubt the impartiality of the Russian press covering Ukrainian events. Twenty-six percent said the media was distorting the real picture: 14 percent of them said such a media policy was dangerous and harmful and 12 percent said it was correct and grounded. Eleven percent of the respondents were undecided.